The Problem: Lynn, a private university in Florida, found that many of its 2,800 students, who come from all economic backgrounds, were not buying some textbooks (print or digital) because they said they cost too much. Administrators and faculty members believed that not having textbooks for the courses was hurting student success. The Goal: Create free digital faculty-written textbooks and materials for core curriculum courses that would be easily accessible to all students enrolled in those classes. (All Lynn freshmen are provided Apple iPads, upgraded from minis  just a few years ago.) The main purpose of the iBooks, as they are called, was to lower student costs; however, Lynn hoped they would also increase engagement between students and instructors. The Experiment: A few years ago, Lynn established a university press to support faculty-written ebooks created for iPads. Lynn University Digital Press , which operates out of the institution's library, in some ways formalized the authoring process between faculty members, instructional designers, librarians and others that had been taking place at the university for years. Lynn asked faculty members to write digital textbooks for core courses because all undergraduates take them; that's also where the university believed it could have the biggest initial impact slashing textbook spending. Amy Filiatreau, director of the library, said during a presentation at the annual meeting of the Association of College and Research Libraries last week that Lynn gives any faculty author an Apple MacBook and a $2,000 stipend per course. The faculty-written book program is just one of the university’s efforts to reduce textbook costs. Lynn also implemented a textbook reserve program, in which it keeps at least one copy of every required textbook available for loan at the library. Plus, it’s moving to open education resources (OER) or library-licensed ebooks. What Worked (and Why): Since the initiative began a few years ago, Lynn has more than 40 faculty-written iBooks in use and 12 more in the pipeline. Filiatreau said this week that the free books will save Lynn students about $250,000 during the 2016-2017 academic year (as compared with the cost of buying all-new textbooks). The faculty has enthusiastically embraced writing the ebooks, Filiatreau said, adding most of the content is written by long-term instructors. She also said iBooks allow instructors to tailor the content to their courses' needs, keep the content fresh and relevant, and structure a curriculum that complements conversations in the classroom. Plus, faculty authors immediately add their iBooks into the institution’s LMS as the default course materials. Finally, the Lynn campus bookstore, which no longer sells textbooks, is supporting the project, Filiatreau said. The bookstore doesn’t distribute the digital iBooks directly, but works with an online third-party bookseller, MBS Direct, to get them to students. Next Steps: Lynn is implementing a blind-peer-review process for all faculty-generated iBooks; the first “handful” is being evaluated now by reviewers not associated with the university, Filiatreau said. Students will continue using beta versions of the books while they are being reviewed, she added. 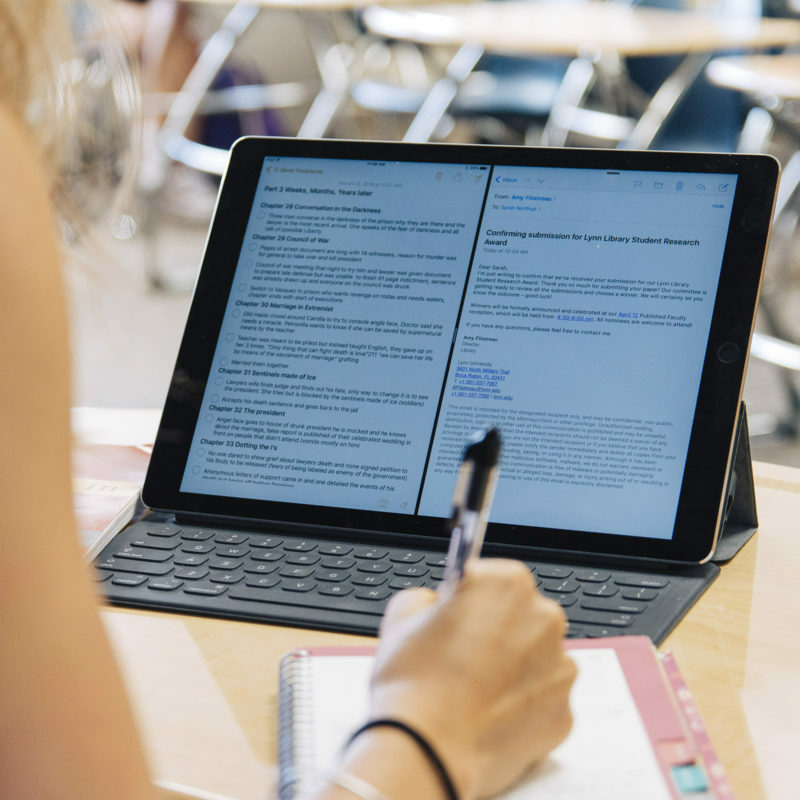 Besides the core curriculum, faculty members now are writing iBooks to replace textbooks in courses with high numbers of students and multiple sections. Going forward, the university’s goal is make all faculty-produced course materials “living books” that are highly interactive and all contain graphics, quizzes and lots of videos, Filiatreau said. Lynn students all receive iPads, which is how they access faculty-authored course materials.